IT IS THE MIDDLE AGES and you are sick or injured. You are not wealthy enough to afford the luxury of being treated by a doctor in your home. Or you are traveling from one village to another and need a place to lodge for the night. Or you are a monk or nun who has become ill and needs special care within the monastery or convent. Or, perhaps, you have received from a panel of experts in your parish the dreaded diagnosis—leprosy. What will you do? Where will you go? How will you be taken care of? For all of these conditions, the answer was the same—and to some degree, so was the care received—in that developing institution known as the hospital. 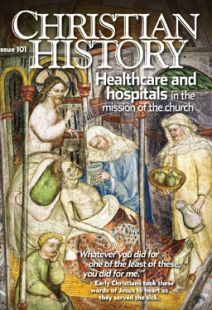 Medieval hospitals varied widely in their size, location, and staffing; what follows is a composite picture of what your experience might have been as a patient—beginning with whether you would be able to become a patient at all. Although some hospitals welcomed all comers, including travelers and beggars to whom they gave alms, many others had restrictions: common restrictions included refusals to admit the insane, epileptics, those with contagious or incurable diseases, ­pregnant women (especially if unmarried), and lepers. One major way in which your experience would be different from that of a modern hospital was in the size of the institution. Although some famous hospitals, especially in the East, were large endeavors—the Pantokrator xenon in Constantinople had fifty beds, an old-age home with space for twenty-four residents, a leper house, and an outpatient drug dispensary—it was more likely that, if admitted, you would find yourself in a setting with fifteen to thirty other patients. These would largely be adults, although some hospitals did take in abandoned babies and orphans. The wealthiest sick people were usually cared for at home in their illnesses, but nearly all other classes might be represented. In another difference from modern hospitals, the hospital would probably be outside the center of town or outside the town altogether, especially if it was a leper house. There were several reasons for this. The desire of many towns to exclude the sick and infirm was one, but founders of hospitals often chose such sites themselves because land was cheaper, there was more space for buildings and gardens and more quiet for prayer and contemplation, and the building could be situated along a main road, where it was easier to welcome travelers and solicit donors. Situating a hospital by a stream not only provided the obvious usefulness of running water, but also meant that the hospital could draw income from tolls on the associated bridge. After admission ceremonies, you would be given a bed—in some cases a bed of your own, in other cases one shared with another patient. Likely, there would be a small place for stowing personal belongings—some monastic infirmaries featured a small chest of drawers, also outfitted with a tray for taking meals in bed. Men and women were housed in separate spaces, and if the institution was large enough there would be separate wards for more seriously ill patients as well. At the Pantokrator, separate sections were established for wounds and fractures versus diseases of the eyes and stomach. Colder air circulated in the Pantokrator’s infectious disease wards, as this was seen as a guard against future infections. Most important, though, was the location of the beds in conjunction with worship spaces, because the round of worship in a medieval hospital was considered to be one of its most important functions. All seven of the daily prayer offices were observed, and mass was usually said every morning as well, provided the hospital had a priest on staff (most did). The schedule began with matins at midnight; at 3 a.m. you would participate in lauds (morning prayer), possibly followed by a mass of the Virgin Mary or private masses. ­Between 6 and 10 in the morning would be the “little hours” (prime, terce, sext, and none—literally “first, third, sixth, and ninth”), ending with a mass of the day and, sometime before 11 a.m., the morning meal. Vespers and compline (two forms of evening prayer) would be celebrated ­between 11 and 5, followed by dinner. Hospital personnel—monks, nuns, and lay staff whether volunteer or paid—were expected to attend, or to say the office at their place of employment if they could not be in worship. In some cases, the hospital also served as the parish church and would regularly be attended by members of the community. But worship was also to be observed for the spiritual benefit it would give the patient. Some smaller hospitals, especially those within monasteries, were designed so that the patients’ beds actually faced a central worship space in the same building. In others, the infirmary was located very near the chapel, so that you could hear and see as much of the service as possible—including being able to see the Host even if you could not receive it due to your condition. If your illness allowed it, you would be expected to attend services. Religious art and relics would surround you, and a confessor might visit occasionally to discuss the state of your soul and the meaning of your illness, and to administer confession and absolution. Once you had been adopted into the daily round of ­hospital life, what sort of medical care might you receive? In many cases, as historian Martha Carlin ­comments, “the treatment most likely to have been available . . . was bed rest, warmth, cleanliness and an adequate diet.” For the poor and homeless in particular, this level of care in itself would have improved at least your spirits and possibly your health as well. If you were going to remain in the hospital for any length of time, you would be assured of a daily allowance of food, as well as clothes and in some cases money. Hospital diets varied by time and place, but in many cases sound more appetizing than the institutional food of our own day. In early Byzantine hospitals, the sick were given bread, wine, and vegetables with olive oil; sick monks received dispensations from fasting. (At the Pantokrator, patients were allotted each day bread, oil, two onion heads, and a money allowance to purchase additional food and wine.) Later English hospitals served variations on the typical British diet: you would have eaten bread, meat or fish, pottage, and plenty of cheese and butter. Ale (brewed from barley malt) was particularly important as a source of nutrition; French hospitals served wine instead. Vegetables and fruits for the hospital kitchens came from the hospital gardens, as did medicinal herbs and plants. One hospital, at St. Giles, Norwich, included on its grounds an ornamental garden, a “great garden” for fruit trees and vegetables, a pond, a piggery, and a kitchen garden. The hospital sold its leftover apples, pears, onions, and leeks for profit, and produced saffron, garlic, hemp, and henbane for medicines. The garden at St. Gall is known to have produced roses, lilies, sage, rosemary, fennel, iris, opium, watercress, pepperwort, and mint. If your condition required, you might be given a herbal bath with ingredients deemed appropriate to your particular illness. Herbs were also used in mixing medicines to be taken by mouth and in aromatic mixes to freshen and purify the air. If able, you might walk in the gardens yourself for rest and recuperation. Two concepts governed medical treatment. One, inherited from the medical practice of the ancient Greeks, was that the body was composed of four humors—black bile, yellow bile [choler], phlegm, and blood—and that illness occurred when an individual’s “blend” of these humors became unbalanced. Then the body would try to heal itself by driving out the offending substance, in a variety of ways—bleeding, sneezing, vomiting, voiding, and developing skin rashes. Caregivers might hurry the body’s own process along through bloodletting, diuretics, expectorants, cauterization, and irritating the skin. In addition, treatment proceeded according to what was known as the regimen sanitatis, or “healing regimen.” This focused on the prevention and treatment of illness through proper management of the “non-naturals:” air, food and drink, sleeping and waking, motion and rest, excretions and retentions, and dreams and the passions of the soul. Wealthy patients could commission their own personal “regimen” from a doctor, but general principles were available to all through popular medical tracts. One of the most famous of these was the Regimen Sanitatis Salernitatum from the Medical School of Salerno, Italy (see “Prescription for health,” p. 29). Part of this regimen might involve the use of ­music. This was particularly true in the Byzantine context, which was influenced by the extensive culture of music therapy in Islamic hospitals, but even Western hospitals provided a round of liturgical music to soothe your soul, and in some cases other music as well. A rulebook from St. Augustine’s Abbey in Canterbury prescribed music to raise the spirit of a depressed patient, who “may be led into the chapel by the infirmarius, or carried there in some manner, so that, the door being closed, a stringed instrument may be sweetly played before him by any brother, or by any reliable and discreet servant, without blame.” Other monasteries provide evidence that patients might be distracted with music while being bled. When might you see a doctor? And what kind of doctor would it be? Not all hospitals had physicians. The Pantokrator, which had an overall capacity of perhaps 200 patients, had an amazing (for its time) 21 physicians, some specializing in medicine and some in surgery, as well as 46 nursing assistants and 6 pharmacists who compounded medicines. However, this was unusual. A small hospital might have few or no doctors, although in times of need—complicated illnesses or traumatic accidents—physicians or barber-surgeons could be brought in. This did not mean that you would not receive care from someone knowledgeable in medicine. In many hospitals, this was the infirmarius, a monk or nun with a calling to the work of attending the sick, and who had acquired informal medical training through extensive reading and practice. An infirmarius usually visited twice a day; he or she might deliver food and change bedding, but would also diagnose illnesses—chiefly through examination of your urine, one of the major medieval diagnostic tools—as well as preparing prescriptions and discussing with you the state of your soul and body. In one famous story, Henry I of Bavaria tested the diagnostic skills of Notker II, the abbot of St. Gall, by providing urine from a chambermaid instead of his own; Notker not only uncovered the deception but correctly diagnosed the chambermaid’s pregnancy as well. Women as well as men served as medical practitioners, including as licensed physicians; many specialized in the treatment of women’s conditions or (as at the Pantokrator) would be assigned to women’s wards. What if, in the end, all of this was not enough, and you found yourself facing death? Then it would be most important that you died well, free of sin and ready to meet your Lord. You might be put in a separate room; you would certainly make your confession and receive absolution, with the holy oil placed on the sense organs and other parts of your body that were suffering. The whole community would pray for you in the round of services, and staff would keep vigil by your bedside, talking, praying, and reading the Bible to you. Jennifer L. Woodruff Tait is affiliate or adjunct professor of history/church history at Asbury Theological Seminary, Huntington University, & United Theological Seminary.